This shopping guide is organized geographically – starting at the corner of Hana Hwy and Baldwin avenue, heading uphill, these are the shops on the right. I’m not sure how many parts there will be to this Paia shopping guide -there’s a lot of great shops in this town! As things change, please add a comment below and I’ll update the listings! Paia Fish Market – A Paia Institution since 1989. Order a fish burger. And some fries. Family Style dining – plus they serve beer! Great stop after a full day at the beach. Paia Mercantile – A great shop (with a second location in Lahaina) to pick up the perfect souvenir or gift for friends back on the mainland. Love the Beach– The shop’s owner, Lucinda, has been designing swimwear on Maui and Oahu for over 25 years. She has hundreds of styles and fabrics to choose from to create your own vision of the perfect bikini. Maui Girl Swimwear Choose from a huge selection of mix and match suits, designed here on Maui, or from their boutique suits, as seen in the Sports Illustrated Swimsuit Issue for several years running, hand-sewn on island! Mix and Match for the perfect top and bottom combo! It is with great sadness that I report the closing of the Hemp House. Lilikoi Beauty An excellent selection of quality bath and body products, gifts, and jewelry by Debra Mack. Also carries some baby gear, including clothes, swaddling blankets, etc. Moonbow Cabana – A quality clothing and gift boutique, with its own line of jewelry by Cyndi Jay. A ‘brother’ (menswear) store is across the street, with more locations around the island. You may even get to see them making the jewelry on the spot! Sailboards Maui– Another Paia Institution, a classic surfboard shop. Dahlia’s – Maui’s exclusive retailer for Queen of Hearts clothing line, also carries Bodhi Waves jewelry by Alexis Kohn, and Kopa Haiku skincare products. Kiwi Johns – A fun t-shirt and hat shop. 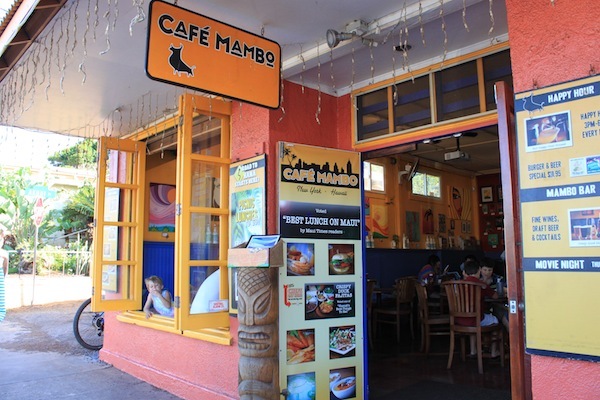 Cafe Mambo – Celebrating their tenth anniversary in Paia, Cafe Mambo serves an eclectic menu with the best dishes from the owners travels around the world. Come for the chilled Maui Brewing Co. beer on draft, stay for the Crispy Duck Fajitas. Paia Style – This little hole in the wall has a bunch of hidden treasures amongst the traditional souvenirs – including locally made Hawaiiana and these fantastic coconut frond dresses. Locally made tikis – a classic souvenir! Cafe Des Amis – Mediterranean and Indian food. The menu has changed very little since the day this place opened – they know what they do well. Everything on the menu is excellent – you can’t go wrong. Offers cozy indoor or casual al fresco dining. Crepes, Curry, Coffee and more… all delicious! Hi-Tech One of the original surf shops on Maui. Grace Beauty Salon & Nohealani Boutique – Offers facials, massage, waxing and nails, and a selection os skincare, including their main line – Eminence, and the locally made Queen Bee Productions and Gourmet Skinfood. Sharing the store front is the Nohealani Boutique, which carries unique clothing lines, including a line of locally hand painted denim attire! Hand Painted on Maui – DENIM! Locally designed and printed tote bag, recycled cotton. Painted and Jeweled denim shorts! Coming soon – More of Paia – which section should I hit next??? Keep me updated with your news of Paia – and any locally made products or companies at lizsmithonmaui at yahoo dot com ! So many great shops and restaurants there – love Paia! Hi Liz! FYI, I was at the San Lorenzo swimwear shop at Ka’ahumanu yesterday and they were having a moving sale. The ladies at the register said that they were closing the mall shop “any day now,” and will be moving to a not-yet-disclosed site in Paia on Sept. 12. Move over Paia bikini shops…there’s another one comin’ to town. Hey Liz awesome blog I loved seeing all the stuff available now in paia. I have my eyes on those Buddha earrings for sure! !